In the previous post we cobbled together an SDL2 project in Xcode 9. We have a very simple program that starts up, initialises the SDL2 framework and then shuts down. This gets us over the initial hurdle of setting up a game project but we are still along way off from having a working game. In this second part, I will be writing a simple game loop using SDL2. If you don’t know what a game loop is, or need a refresher, go ahead and read about it in Game Programming Patterns. The game loop is an important foundation of any game engine and its important to get right. I plan to develop this over two articles, in the first (This one) we’ll get the basic loop in place. Then in part 2, we’ll refactor the basic loop into something more maintainable. Anyway, without further ado, let’s get started. I’ve put together a couple of side projects with SDL2 over the years. I like the library because of it’s simplicity and how it provides a quick way to throw together a cross platform project. This post is a reasonably comprehensive guide to how I set up an Xcode 9 project that links to the latest SDL2 framework. There are other ways to do it, but this is mine. In a previous post I talked about how I setup a Ubuntu server using LXC on my QNAP NAS server. The plan was to host a small web application I am developing using the Go programming language. In this post I’m going to outline the steps I used to install Go on my server but these same steps should apply to any Ubuntu system. Of course you can use the official installation instructions on the Getting Started page. These steps include some extra detail for those of you running on bare bones installation over ssh, so if the official instructions aren’t working, maybe these can help. For a new project I am writing a small web application in the Go language. From the off I wanted to have a server setup to host the application so I can more easily test everything out. Being something of a DIY tech head I thought I’d use my QNAP NAS system to run the server since the hardware mostly just hosts my Time Machine backups at the minute and not much else. QNAP has an application called Container Station which provides an easy way to setup web applications through Docker or run Linux instances with LXC. I’ve previously used this to setup a CouchDB instance with Docker so I decided to install Ubuntu as an LXC container to see if I could get it to run my web server. Let me begin this post by cutting straight to it. Sublime Text is awesome. I’ve had it installed on my computer for ages and cracked it out every now and again to edit some simple text documents, but never really used it in anger. Recently I’ve been working on a project on Linux which is composed of various bits of technology written in different languages. I was spending my days bouncing between a combination of C++, Pro/C, Perl scripts and PL/SQL, hopping backwards and forward between various command line tools and IDEs. It was becoming a bit of drag as having to constantly switch modes all the time was breaking my stride and slowing things down. 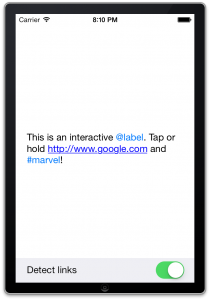 You often see apps with links, hashtags and usernames embedded in labels. I’m thinking of the many Twitter and Facebook clients out there in particular. I wanted to achieve the same effect in a client app I’m writing but there didn’t seem to be a nice way to do it with the native UIKit controls. Yes, I know it’s possible to get close to what I need with UITextView, but this isn’t easy to extend with new link types and introduces problems with interaction when its in a table cell. I tried a few open source UILabel replacements that I found and they all seemed a bit buggy or at least wouldn’t work how I expected them to. I’ve ended up writing my own UILabel replacement, which you can find here on Github. KILabel is an extension of UILabel that adds the ability to automatically hi-light URLs, twitter style @usernames and #hashtags. It also provides a simple way to respond to users tapping on any of these using blocks. To use it just include the source code in your project and set the custom class of any labels in your nibs to KILabel. KILabel uses ARC and TextKit so it’s iOS 7 only. It overrides UILabel’s text rendering to use a NSLayoutManager, NSTextContainer and NSTextStorage for rendering text. 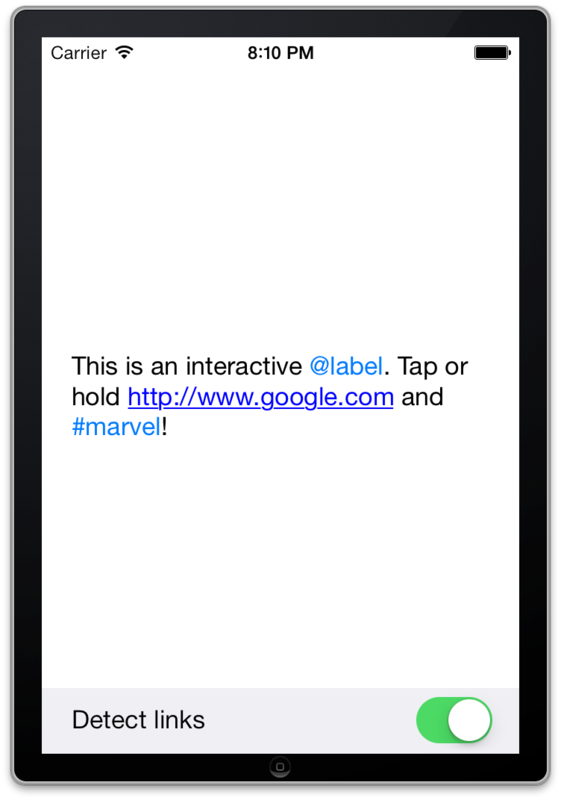 TextKit gives simple access to all sorts of text rendering operations which allow things like this to be implemented. There’s a useful TextKit primer here for those that are interested and my source code is quite heavily commented so it shouldn’t be too difficult to understand what’s going on. I plan on extending KILabel as I need to, but if anyone else finds it useful and has any feature requests, please pop them in the comments.